The challenge of protecting critical infrastructure and public facilities is becoming increasingly difficult for security forces. The growing level of complexity makes fully-integrated, networked security systems necessary. This can only be achieved by a combination and connection of both mobile and stationary security applications. Leading German security companies have come together to work towards this goal. MSS (mobile screening solutions) is a newly established security consortium that addresses this challenge with a fully-equipped screening vehicle as a mobile checkpoint. 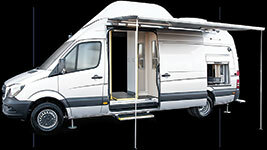 They have equipped the MSS vehicle with the highest quality security solutions and developed it into a unique mobile security platform based on the Mercedes-Benz Sprinter. Geutebrück is a premium partner of MSS and equips it with video solutions. The vehicle was presented to the public for the first time at IDEX in Abu Dhabi from 19-23 February. With the increasing threat of acts of terror and violence, it is more important to protect crowds of people. The greatest risk emanates from bomb attacks, positioned either on the attacker’s body or placed in a vehicle, and from hidden weapons. They need to be tracked down before they can reach critical areas with large numbers of people. With the MSS screening vehicle, the vision of a fully-integrated mobile security concept becomes reality: as a mobile security centre, it carries innovative detection and screening equipment, including metal and liquid explosive detectors. People and baggage are scanned in the vehicle through walk-through slots and they can also be connected with mobile scanners outside the vehicle. “As an MSS premium partner, we provide high-quality video solutions that are tailored exactly to these mobile challenges. This means more than just surveillance: with our management system, all recordings and live images are displayed clearly, providing an overview that makes it possible to react instantly in case of an alarm. With our video analysis, suspicious persons and situations can be identified and alarms triggered,” explains Christoph Hoffmann, MD of Geutebrück. “The cooperation with Geutebrück allows us to use the MSS vehicle as a variable expansion of building or event security and provide it as an additional just-in-time resource, even at airports if necessary. MSS stands for mobile solutions; with SIOS.ONE (Smart Integrated Object Security) we offer fully-integrated high-security solutions for the protection of buildings and properties. All components, both mobile and stationary, are interlinked and we can represent the information that we collect from them at an extraordinary depth, making early identification and detection of dangerous persons and baggage possible,” says unival group MD, David Vollmar. The following companies are part of the MSS|SIOS.ONE consortium: Daimler, Hartmann Spezialkarosserien, unival group, Geutebrück, Bruker Detection, XRIS, THIEM Security Solutions, CProjekt, Elettronica and the Austrian Institute of Technology AIT.